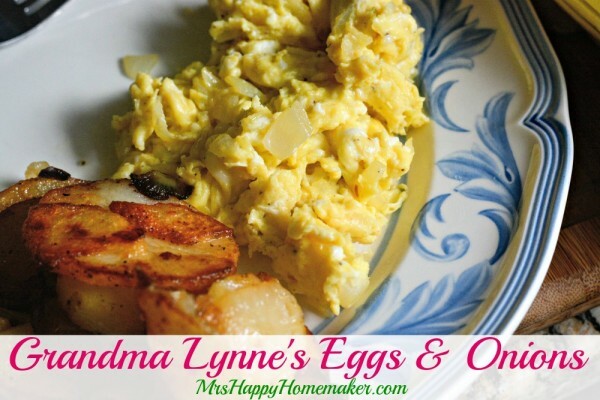 I never liked scrambled eggs before trying this recipe for Grandma Lynne’s Eggs & Onions. Now, I can’t get enough! Bonus points – you only need 3 ingredients (not counting salt & pepper!). I have never been the biggest fan of eggs. I’m just not. Wait, I take that back. I absolutely love my deviled eggs (which I’ve been told are the best ever many times!) But, if it’s not my deviled eggs… I’m not exactly a fan. However, since I have several hens in my backyard that give me almost a dozen eggs a day… I really need to like eggs a lot better than I do. Guess what? 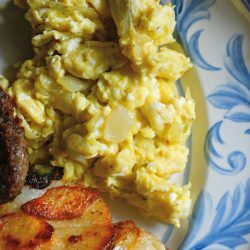 I found a recipe for scrambled eggs that I really, really love… the only scrambled eggs I’ve ever truly loved and craved. That’s a feet in itself. 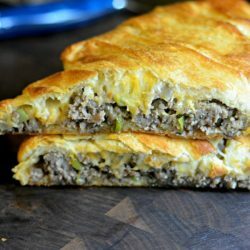 The recipe actually comes from the family of my Michael’s oldest & best friend – Eric. 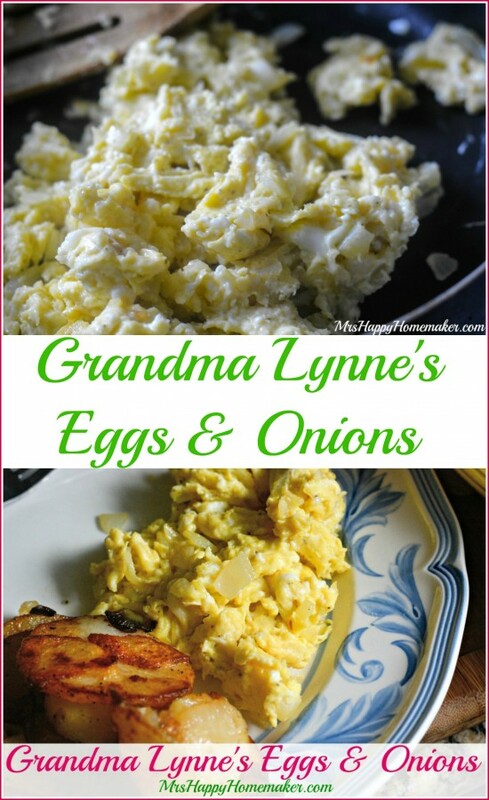 It was his grandma’s eggs that she taught his mom to make, and his mom in turn taught him to make. I tried them on a whim & was pretty surprised when I wanted seconds. 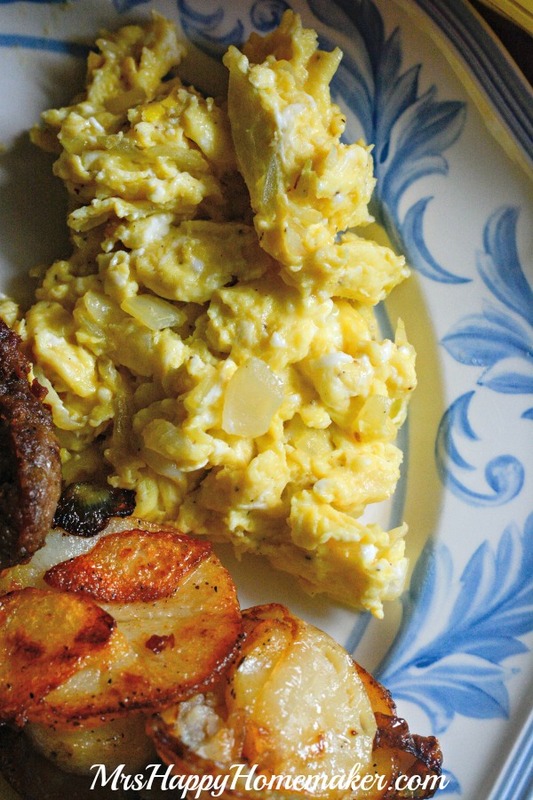 Wanting seconds of scrambled eggs is something that has never ever happened to me, my friends. Ever since trying them, this is the only way I will eat scrambled eggs. They are so stupidly simple to make too. 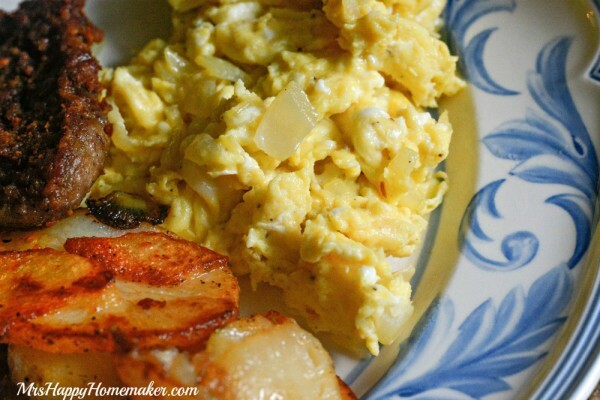 All you need is butter, eggs, minced onion, salt, & pepper. And this is all you do. 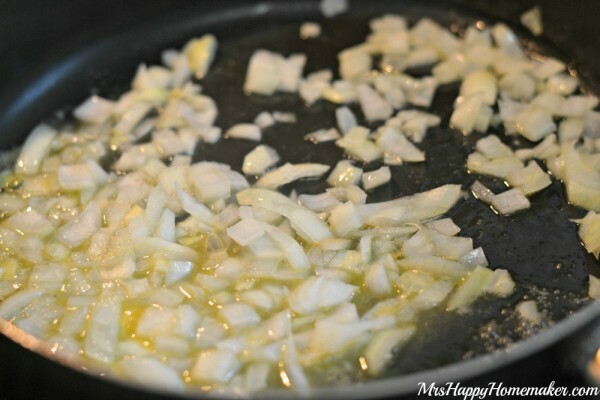 Saute one small onion with a little bit of butter on medium heat. Cook the onion until translucent. 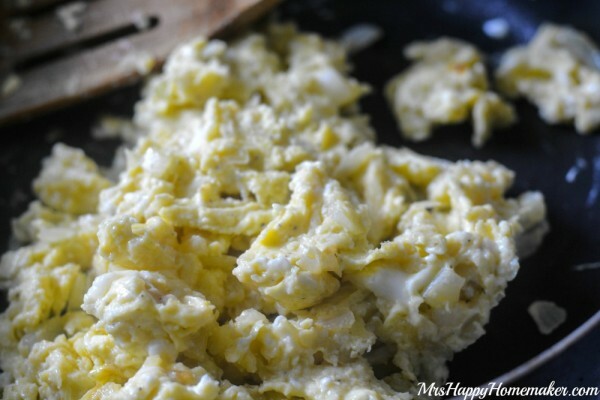 Scramble 5 eggs in a bowl with a fork. 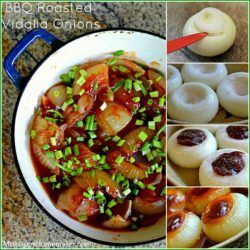 Pour into the hot skillet with the onions. Cook on medium heat, while stirring & scraping the bottom of the pan occasionally, until the eggs are cooked through. Season to taste with salt & pepper. 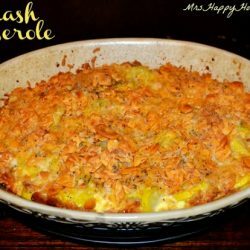 You can add cheese too if you like, but they’re delicious just as they are… and this is coming from a self described egg hater! 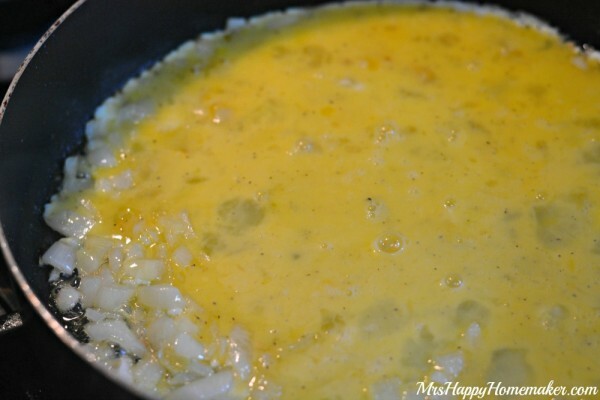 Melt the butter in a skillet heated to medium heat. 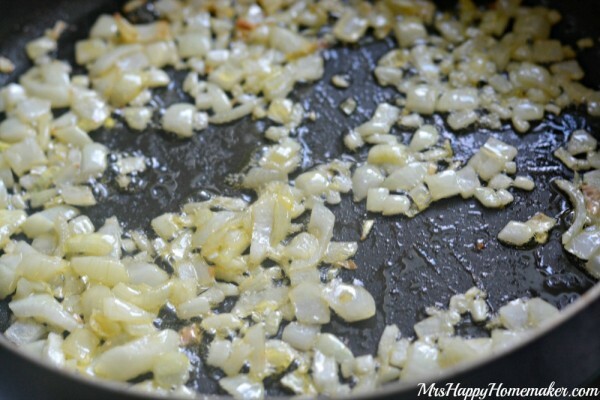 Saute the diced onions in the skillet until translucent. 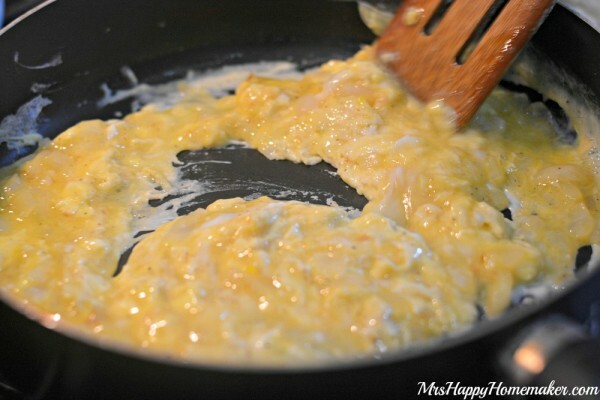 Pour the scrambled eggs into the hot pan. Cook on medium, stirring & scraping the bottom of the pan occasionally, until the eggs are cooked through. Season with salt & pepper. Melt cheese on top if desired.